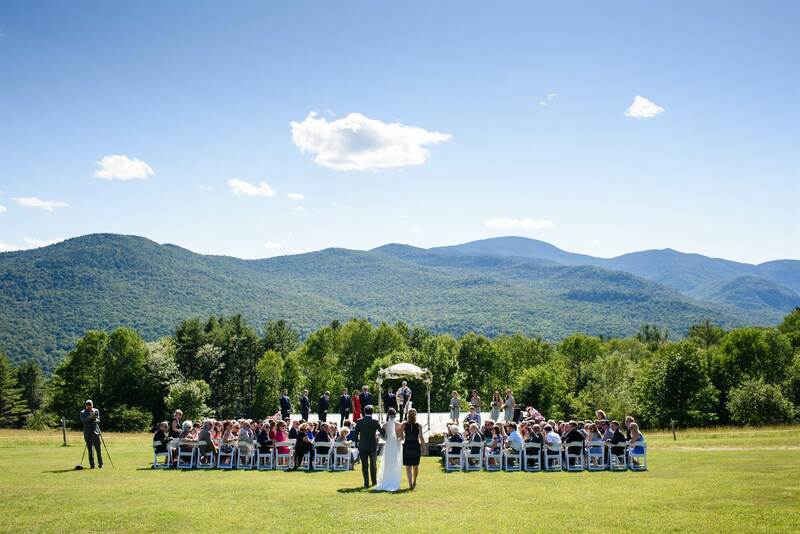 Whether you are planning an intimate affair with 50 of your closest family and friends or a large-scale reception with 200 guests, Trapp Family Lodge has so much to offer for your wedding ceremony and reception. Situated on 2,500 gorgeous acres overlooking the valley and surrounding mountains, our resort and wedding venue in Stowe, Vermont offers a unique combination of sophistication and natural beauty for an unforgettable event. We offer numerous indoor and outdoor spaces for your ceremony and reception. Our team will be happy to make all the necessary arrangements to ensure your big day is flawless from beginning to end. Perfect for events any time of the year, our Stowe lodge offers three spectacular banquet halls for you to choose from: the Mozart Room, Main Dining Room, and Salzburg Room. Host your special day in one of these beautiful, rustic spaces for an unforgettable experience. Our largest indoor venue, the Mozart Room accommodates 80-100 guests for wedding ceremonies and/or receptions throughout the year. This room can be arranged for either a plated or buffet-style meal, with space for a small band and dance floor. The Mozart Room is a stunning, post-and-beam room with high ceilings and an open-hearth fireplace that adds an extra touch of elegance to your wedding celebration. A lovely adjoining patio and lawn provide additional space, with an optional tented enclosure. The Main Dining Room is available for indoor weddings and receptions throughout the year. This room features ample space for your guests and large windows offering views of the beautiful land surrounding our resort. For receptions of 50 or fewer guests, we recommend the Salzburg Room, our private dining space adjoining the Main Dining Room. The Salzburg Room is perfect for smaller, more intimate weddings. This room can also be used as a back-up cocktail hour location for any Mozart Room or Wedding Tent celebration. Our Vermont resort offers some of the most picturesque settings for an outdoor wedding. Ideal for wedding ceremonies and receptions between the months of June and September, our property offers several areas where an event tent blends perfectly with our mountain landscape and perennial gardens. The best part about our outdoor venue is that the size of your wedding is only limited by the size of the tent you choose. Tent rentals are required for all outdoor functions in case of inclement weather. Our large, hilltop Wedding Meadow, with a panoramic view of the mountain ranges surrounding Stowe, is secluded from the Main Lodge. It is an idyllic setting for a tented wedding ceremony or reception. In this space, the sky truly is the limit. This picturesque location is nestled in a quiet corner of the front lawn. Surrounded by perennial gardens and evergreens, this site is close enough to The Lounge entrance to be convenient for indoor and outdoor functions, yet secluded enough to offer the privacy you seek. This site can beautifully accommodate a wedding tent. With the broad vistas of Nebraska Valley as its backdrop, this is a dramatically beautiful setting for any occasion, including our summer “Concerts in the Meadow.” We are pleased to offer our concert stage for your wedding ceremony. The gradual slope of the lawn provides an unobstructed view for all your guests. The following reception can be in a nearby outdoor setting, or indoors.